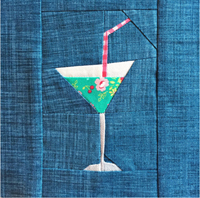 I will be teaching two different classes at QuiltCon. The Sunday design class is sold out, however, I still have a couple of spots open in the Sewing Organizer classes, one class is Friday Feb 19 and the other is Saturday, Feb 20. 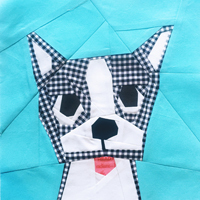 So if you want to learn a some great paper piecing tips, and make a super cute wall organizer to boot, go to the QuiltCon site and sign up! Keep in mind, advanced registration ends on Feb 7 and no MQG discounts will be given if you sign up at the event. I saw your demo at QuiltCon in the demo area. Very impressive! Love your sewing organizer - have pattern in the spring issue of stitch. Can you tell me the fabric line with the words that you used for the machine parts. Love this pattern. I need to make a wall quilt with this machine. I wish I could tell you! The piece I have left doesn't have a selvedge. If I had to guess, I'd say it's probably a Suzuko Koseki fabric. It's at least 3 years old, so maybe look through some of her collections that came out then.